Lock single drive controls of all skidsteers. 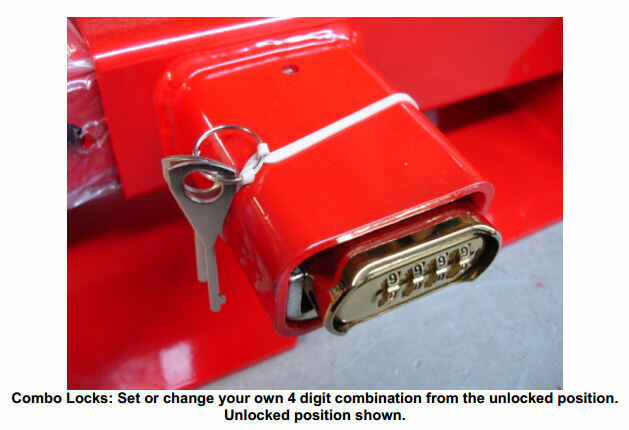 Thank you for your interest in The Equipment Lock Company products. Your question for the enclosed cab application is common. YES, it will work! 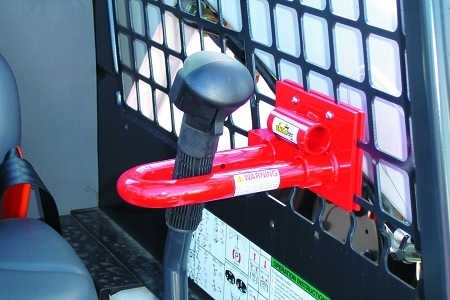 The E-Series Lock, which locks one drive control lever, mounts permanently on the cage by "sandwiching” two plates on the cage. In the case of enclosed cabs, the locking plate is installed on the outside of the cab and the 3/16" thick mounting plate is put on the inside (this allows the glass to slide past it while operating the machine). A window must be open only while the lock is installed. See NOTE below. The E-Series Lock is permanently attached with 4 non-reversing stainless steel screws. The "U-bar" captures one drive control lever and locks into the locking plate (which is secured on the cage) therefore securing the machine. The installation we were told of requires an area directly below the window, in-line with the drive control lever, on the solid steel portion of the protective cage 4" high and 6" “length-wise” (preferred on the left side as if seated). All installation remains the same, but holes must be drilled in the protective cage (ROPS) for the 4 screws. We do not, and cannot recommend this installation method due to liability and warranty reasons with your machine. Again, we do not, and cannot recommend this installation method due to liability and warranty reasons with your machine. Should you drill holes in the protective cage (ROPS) it may affect the structural integrity (warranty), and cause damage or injury. Should you become injured from this occurrence, TELC cannot be held responsible (liability) for your installing the product in this method. Again, we do not, and cannot recommend this installation method due to liability and warranty reasons with your machine. This is why we recommend installing The E-Series Locks on the outside of the cage and leaving the window open while the lock is securing the machine.